The colour blocking on the dress is what grabbed me about this pattern. I quite like the black and white contrast, however that would be a bit too stark with my pasty white, Canadian winter complexion right now. I chose navy and tan with the thought that they would be a bit warmer. 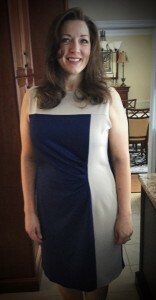 I used a medium weight ponte knit for this dress and it could not have come together any easier. The pattern tracing and cutting probably took as long as it did to actually sew. The front starburst pleating is a nice touch and keeps the dress from being too rectangular or boxy. Here is a close up of that detail. The only change that I made was in the length. 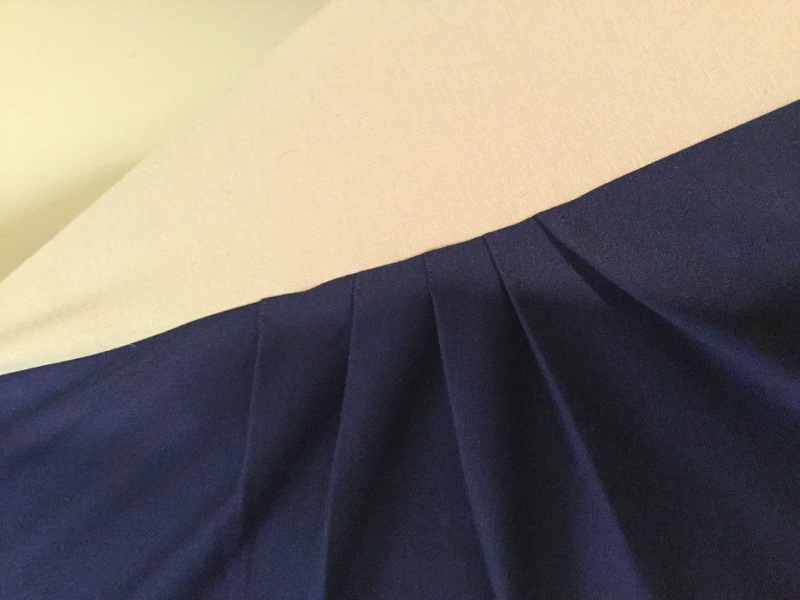 The hem is supposed to fall just above the knee and I would rather it be a touch longer. Other than that it is a great addition to my wardrobe and I look forward to some warmer weather so that I can take it for a test run. Great dress and it looks great on you!! Your gathers are perfect.